Discussion in 'Technical Chat' started by Ray07tacoma, Sep 30, 2010. Please beware that these are comments, the poster(s) do not take any responsibilities of any consequences to yourself or your truck. DTC might not be cleared by turning the ignition switch OFF. Tc and terminal AB twice each in cycles of 1.0 second. within an interval of 0.2 seconds. Repeating 1blink + 5blinks, still looking to see what it means?? 2. Able to clear the code , but they do come back as my problem has not been fixed. Hope this help others, and if anyone can tell me the definition of the codes, I'll appreciate it. Last weekend, removed the wheel and took the clockspring out to repair the broken wire in the ribbon cable. This is a CHEAP ribbon cable and should not fail after only 3 years of service. solder the broken wire, and put everything back >> No more warning lite. 2 days later, airbag light is ON again, from design of this cable it is not possible to solder and fix this cable to last too long as this ribbon cable pass thru a roller guide that stress the solder repair area and will break it again. Yesterday, I finally got a pulled clockspring off a 2010 TRD ($120) also bought a 2010 windshield wiper switch w/intermittent control. Just finish install of both, works beautifully, waring light is Off and airbag is now in working condition. and I also have delay windshield wipers. damn it! 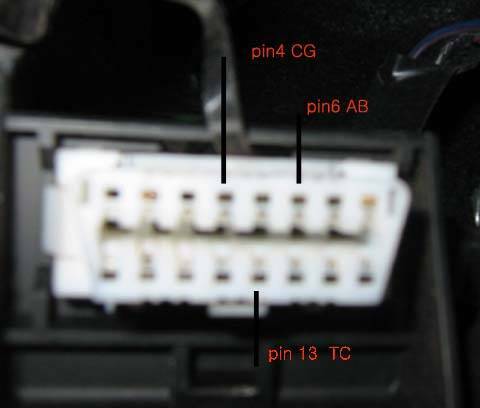 my 07 has a different obdII port. pin6 has no wire to it.